My last post on The Leaping Blackbucks of Tal Chapar posed a dilemma for me. As beautiful as running/jumping Blackbuck images look, there is always the worrisome aspect of provoking and chasing the animals to get the photograph. Why is this worrisome? 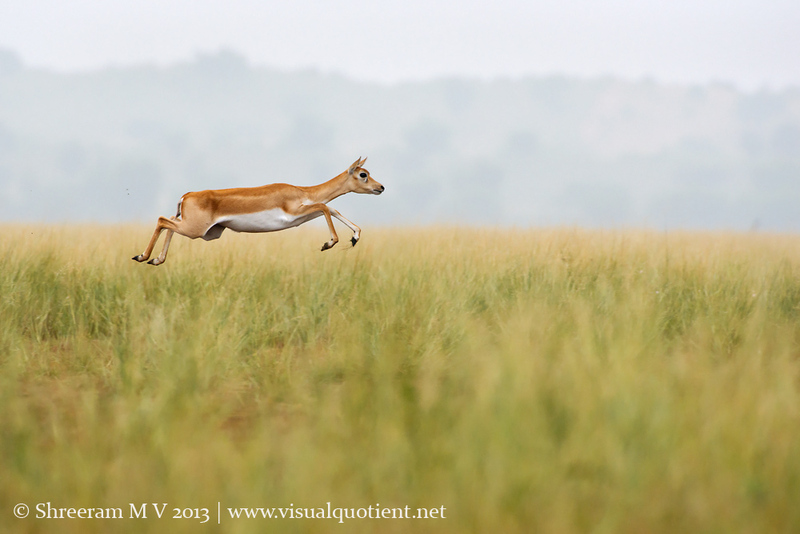 Blackbucks are animals of the grassland. Most of the places that they are found in receive very little rain (with total annual rainfall not exceeding a couple of days of rain in our metros). And, as we all know very well, running and jumping is really tiresome. With scarce food and water, the very survival of the animal is challenged. If your mere presence in the grassland (on foot or in a vehicle) sets the animal into a run-jump routine, go ahead and click away. However, DO NOT approach the animal really close to provoke such a behaviour. And, DO NOT jump out of the vehicle suddenly to get the “angle”. It scares the animal even more. Inform your guide and driver at the beginning of the safari that you don’t want them to scare the Blackbucks. Discourage unethical behaviour at the outset. DO NOT chase the animal in the vehicle or on foot. DO NOT honk or raise the engine noise to disturb the animals. DO NOT shout or clap or make any other noise to send the Blackbucks into a tizzy. So, how did I make those photographs? As I’d mentioned in my previous post, all these photographs were shot as I was strolling along the safari paths at Tal Chapar. I kept my pace slow and was dressed in neutral colors in order to reduce disturbance. Some of the Blackbucks that were crossing the bare safari path broke into a run-jump routine to get to the “safety” of the grass on the other side. This happened a couple of times and provided me the photography opportunities. What does one do when the guide/driver gets over-enthusiastic? This can happen at times, may be with the anticipation of a fat tip. Last year, my guide (at another sanctuary) jumped out of the car in front of grazing Blackbucks and started clapping. He wasn’t even paying heed to me yelling at him not to do that. Needless to say, I was not amused and didn’t even bother picking up my camera to shoot. He got a mouthful from me for that behavior later. So Rule #2 comes handy here. And keep discouraging such behaviour whenever you see it. Remember: The best form of discouragement is to not even pick up your camera. If you have any other guidelines/tips/experiences to share on this, please add them as comments to this post. It is always interesting to get more perspectives on ethical behavior. The underlying code of ethics – DO NOT provoke the animal into running or jumping. It is not worth the photographs. Good inputs Shreeram, I think ethics in photography are very important and pictures should be taken as and when the opportunity comes, rather than chasing them. We should all remember animals/birds first and photography second. Thanks Prasad. Very true. The animal always comes first. Great post Shree. Something else to note here. The pronking or slotting behaviour is a predator response as you noted in the last post. In a place like Chappar, with no known predators, it’s evident that this behaviour is in response to human presence. That itself is something that puts the animal on an edge – the lack of water, etc is quite secondary. So I guess it’s worth remembering that our presence already heightens vigilance behaviour amongst the bucks and probably even alters feeding behaviours as an analogous study of Nubian Ibex in Israel indicates. Any more provocation is probably downright inconsiderate. In a blackbuck rich area like Chappar or Velavadar, one’s bound to make these images if only we’re willing to be patient – it’s only a matter of time. Over zealous behaviour is actually quite unnecessary. Totally agree Sumeet. If you have the Nubian Ibex study handy, could you please share the link? Thanks. Of course Shree. Here you go. Good inputs and guidelines. I also think it is also important for every visitor to the park set these expectations and rules upfront with safari vehicle drivers before entering the park. Thanks Gautam. I am sure if many of us keep reinforcing correct behavior, the drivers and guides would also behave. After all, they do it to earn brownie points with the guests. Great insight into Ethics of Photography… Thoroughly agree and appreciate the effort towards spreading the word on ethics..